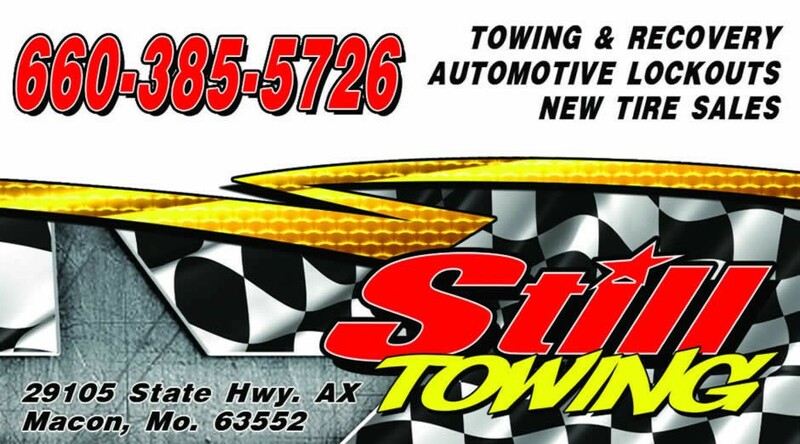 Still Towing of Macon, MO provides towing and recovery service to every shape and size vehicle in Northeast Missouri. Our mission is to provide you with honest, polite, and efficient emergency service. Our staff is experienced and we work with law enforcement to ensure an accident is handled and the road is cleared as quickly as possible. We have a full line of equipment to help in your situation. Located in Macon, MO, the intersection of US Highways 36 & 63, we quickly serve Macon, Bevier, Callao, New Cambria, Marceline, Clarence, Lentner, Excello, Jacksonville, Atlanta, and LaPlata areas in Northeast Missouri. Still Towing accepts all major credit cards.